This might look like a petri dish with some blobs on it, or perhaps lens flare on some glass. But it is actually a rather stunning look at the center of our Milky Way galaxy. 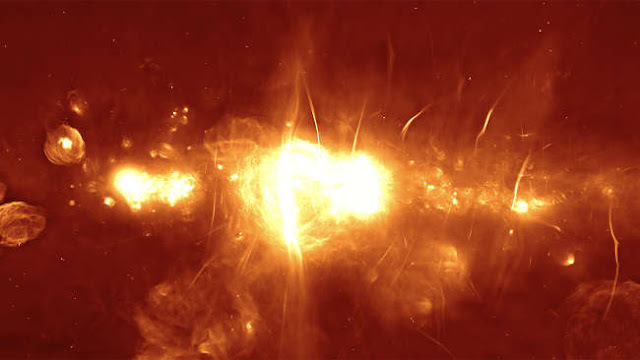 The amazing image was created using observations from South Africa’s MeerKAT radio telescope, an array of 64 dishes across South Africa. These collect radio waves from the universe, and in this case, they’ve been used to build a picture of the supermassive black hole at the heart of our galaxy, Sagittarius A*, 25,000 light-years away. These features include filaments near the black hole itself, which appear nowhere else in our galaxy. First discovered in the 1980s, these filaments are long, narrow, and magnetized. Their origin is a mystery, one that could be solved in part by this research. We can’t observe Sagittarius A* in visible light, because it is shrouded in thick clouds of dust and gas. But using a radio telescope like this (or infrared and X-ray telescopes), we can peer through the dust and glimpse the black hole and its surroundings. A separate project is trying to directly image the black hole itself at the moment. In the image, the galactic center is located in the brightest area near the image center, measuring about 1,000 light-years across. Other bright areas of the image are the result of things such as supernova remnants and star-forming regions.